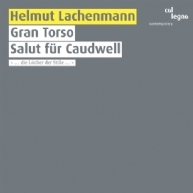 In 1988 the first issue of these recordings of Gran Torso and Salut für Caudwell was awarded the Preis der Deutschen Schallplattenkritik (German Record Critics’ Award); and neither compositions nor recordings have lost any of their value up to today. In Gran Torso, Lachenmann tried to explore the “mechanic and energetic conditions of sound production”. This resulted in singular, unusual sounds which simultaneously exploded the barriers of audibility, playing technique and sound as such. The guitar duet Salut für Caudwell is also defined by new (and traditional) playing techniques and sounds, but the composition at the same time assumes compositional/autobiographic characteristics when the guitarists speak, strictly rhythmically and organized into separate syllables, texts by Christopher Caudwell and Friedrich Nietzsche – thus revealing the composer’s manner of thought during that time. These recordings, by the Berne String Quartet and the two guitarists, Wilhelm Bruck and Theodor Ross, are true milestones of recording history.